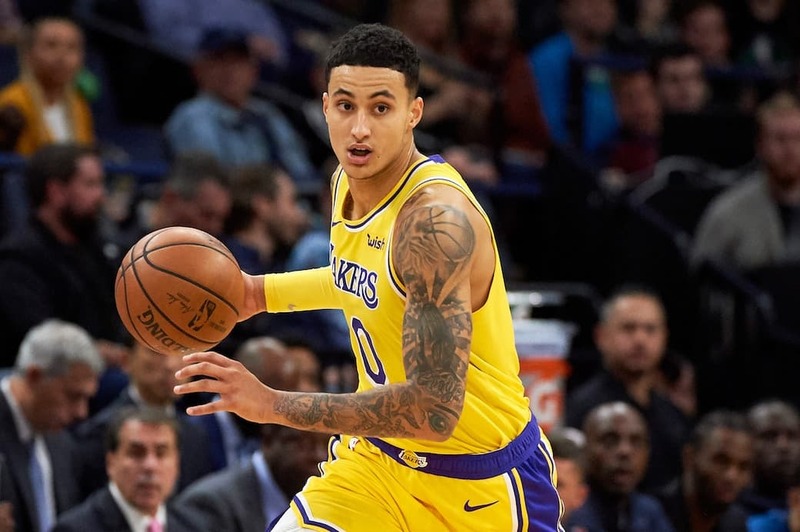 Earlier this week, Slam Magazine caught up with Laker’s prolific scorer (and roasting God) Kyle Kuzma on the night before the Los Angeles Lakers released their Nike “City Edition” jerseys to the public. 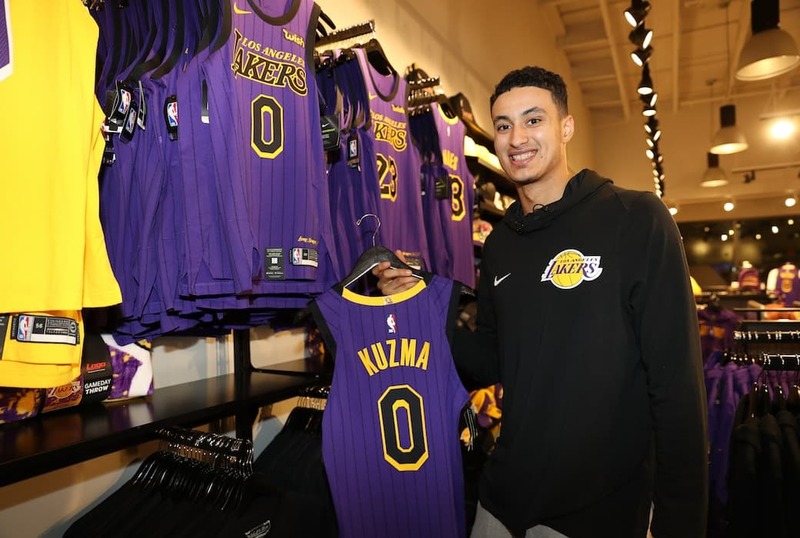 Kyle Kuzma and Robert Horry, in partnership with American Express, made a special guest appearance at the Team Shop in El Segundo. The “City Edition” threads, designed by Magic Johnson, are an ode to the Lakers’ five championships during the Showtime era. The team is set to debut them on Wednesday at home against Portland. 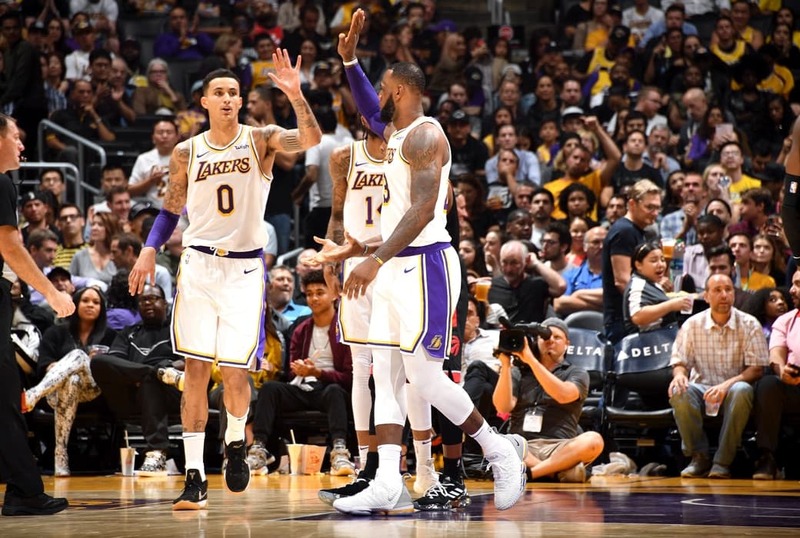 So far this season, Kuzma is averaging 18.5 points and shooting 48.3% from the field. SLAM caught up with the young forward to talk about his favorite jerseys, playing with LeBron James, on-court kicks and his partnership with American Express. SLAM: What was it like during your rookie year to see people rocking your jersey? Kyle Kuzma: It’s an awesome experience [based on] growing up where I grew up [in Flint, MI] and my love for the game. I was the kid wearing a jersey at one point and to see people wearing my jersey is a priceless feeling. SLAM: What were some of your favorite jerseys you had growing up? KK: I had a turquoise Grant Hill Pistons jersey. I had a Tim Hardaway Miami Heat jersey. I had countless Kobe jerseys. SLAM: Speaking of Kobe, you wore his jersey prior to a game against Toronto and Nick Van Exel‘s last year. Any other throwback Lakers jerseys you’re going to bring out this season? KK: Yeah, stay tuned on that one. I don’t want to leak it all out but I got a few—3 or 4 more jerseys that I gotta rock this year. SLAM: Can we get some hints? KK: I got an ’86 jersey [and] a 2001 of another player, not Lakers. I got a few. SLAM: Last season, you won League Fits Rookie of the Year. Any predictions for 2018-19? SLAM: You and LeBron have developed an on-court chemistry this season. What’s that been like? KK: It’s been great. He’s a pass-first guy, a facilitator and I have a scoring mentality, so it kind of works hand-in-hand learning from him every single day. Being around him and him helping me has been great for my development. SLAM: You were eight years old when LeBron made his NBA debut and now you’re on the same team. Did it ever hit you early on this year that you guys were actually teammates? KK: Yeah, I think the first time we worked out in the facility. Just knowing that he was my teammate and being on the same court as him. After that day, I got used to it but it was unbelievable. SLAM: Sneaker-wise, you’re switching it up from older Kobes to even wearing the LeBron IVs at practice. What else can we expect from you this season? KK: I have plenty of older things that I’m going to bring out still with shoes that are in the warehouse I haven’t touched. People are going to be excited when they see what I got. SLAM: In your downtime, have there been any rookies that you’ve enjoyed watching? KK: Yeah, Allonzo Trier…Being un-drafted and the way he’s playing right now is unbelievable. I really like watching him play. He kind of reminds me of myself. I wasn’t un-drafted, but to watch him take the League by storm and have little expectation is refreshing to see. SLAM: What’s your advice to guys that go late in the draft or go un-drafted? KK: Once you get here, it’s an equal playing field. It’s not where you get drafted, it’s what you do when you get drafted—whether that’s coming in and being a starter right away or playing your part, it’s all a journey and a marathon and always be consistent and be ready when your time is called. SLAM: What’s your partnership been like with American Express and seeing all the fans out here the night before the team unveils the “City Edition” jerseys? KK: It’s great. I’m excited to be a part of the American Express launch. Being here and partnering with them is great because it’s opening up the new jersey launch here. For the original article on Slam, click here.